I did some experimental painting on Cirdan. The image is gruely, but I am just not good enough for closeup pic painting. From around 30 cm I like him a lot - well, at least the plate, the face is, well, not so good. I did a couple of more pics, but these were all unusable. I just get used to the new camera. 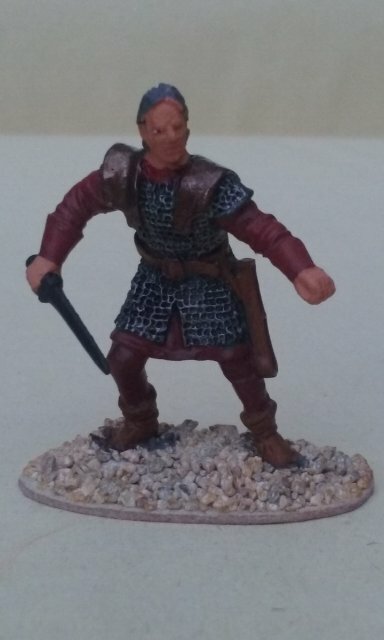 Sorry that I did not register first nor have images of the miniature before or during painting. 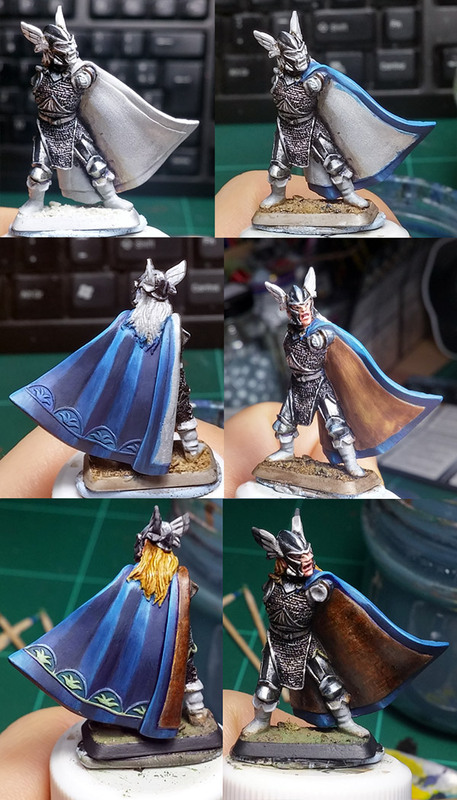 Just leave me out of the contest if thats a problem - I just sorted through my collection recently, remembered the "plate armour contest" and painted him up next to my Viking Saga warband and some RPG characters. 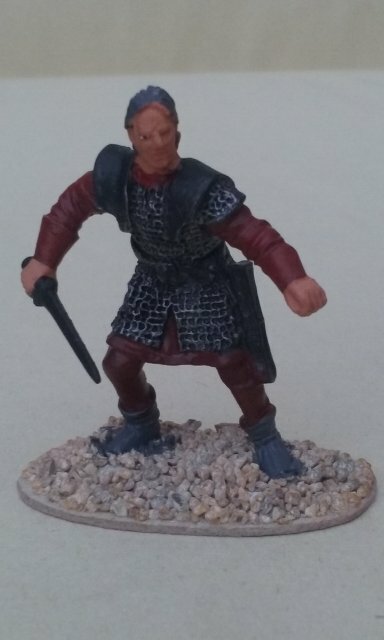 My first painted Mithril for a couple of years. As technic I painted the armour black and just brushed it with acryl "silver" (GWs Mithril, actually, a pot I bought 10 years ago which still is perfectly usable and 90% full) and then highlighted it with alcohol based "silver". The face is just washed, and I will probably redo that some day. I will put up some more images soon. @Gerold: Nice start!! His gaze is interesting, I normally have problems with the eyes size, but yours seem perfect for me. I see some work on the metallic parts too. Have you planned some highlits on the textiles/skin? Welcome on board master Axel! It is good to see an alf with full plate. Master Gerold, you show us very nice work in progress. Keep going. Nice work Axel.... also all those miniatures on enclosed link... fine army ! Nice to see your progress guys!!! and wellcome Master Axel!!!! I like this color scheme very much. Maybe your plate armour should have more brightness ? You should also have a look at the sword which seems bended. To master orc: choosing the right colors is a challenge on its own already ; but I don't see a problem with your colour scheme. Some highlights can change the look of the figure a lot. Master Gerold....a different color for pants? @orc: what's the problem with that colour scheme? I love Angus McBride art!! 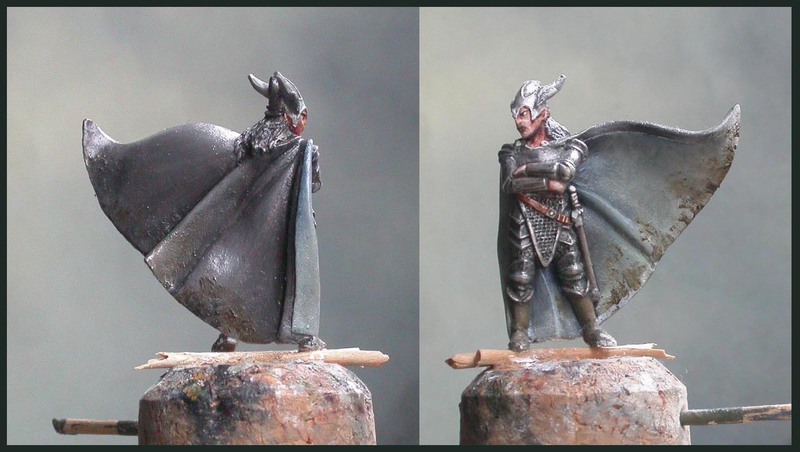 To paint metals we have two paths available, one is TMM (True Metallic Metal) and the other is NMM (Non Metallic Metal). With the first method (TMM) you paint metals with paints that have metallic or shiny pigments/flocked/molt in them, like on Axel's above example. 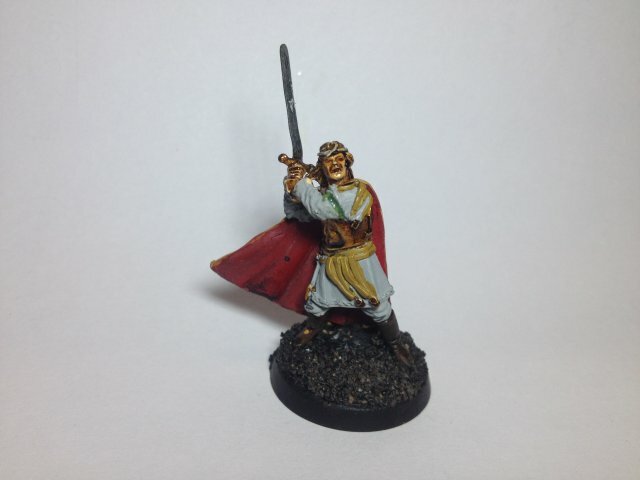 With the second (NMM) method, you will use normal/flat paint and by the ways of colour selection, light placement, contrast and reflections you will try to reproduce the look of a reflective surface like if it were shining. To me, mithril's look better when done with the true metallic metal path. But the NMM method if well executed can give spectacular results (but indeed this is above my actual skills ^^').
. . . the THIRD path is, to use THE REAL material! 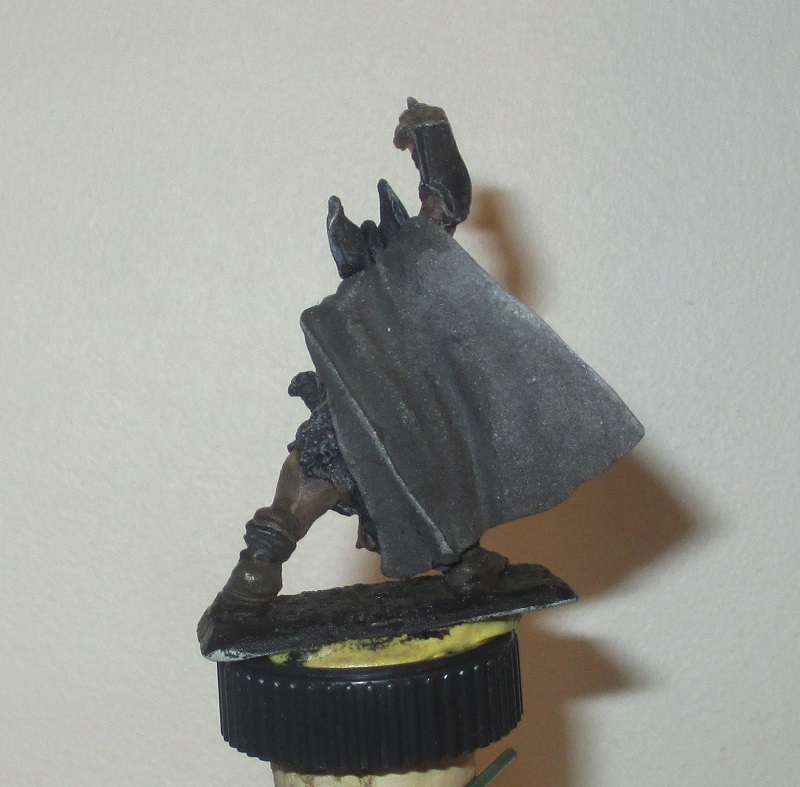 That means you strip off mithril´s undercoat and give the real material a thin and very liquid layer of black colour. I use some brown tones ( burned siena and burned umbra in that case) for some rusty effects too- mostly on orcish stuff. After that I use very fine sanding paper to come back to the real material at those parts which I wanted to highlight. Wow....very interesting information!!! Thanks very much Master Maenas and Master Turambar!!!! Nice to be be part of this painters league many chances to learn new things and improve skills. I'm going to choose go with TMM...I think is more simple hehehe and you know the orcs....we prefere easy ways...so the idea is.... after paint the armour in Golden Color and I give a wash with brown ink.... mix the golden color with white to do it more bright, paint the prominent areas...and give the last lights with white....what do you thing? That was a fantastic thread Thingol!! I was in one of my travels far away from this forums and I did not read it before, but it has great info!! You can try to wash it all as you say and then add in deeper shadows on specific places, you'll get a nicer result! Your idea of that gold looks good, you can also try to mix gold and silver and see what happens... I would keep the plain white for the extreme highlights only, but I think this was already your plan. So I will do it now even if it is only for the starting point. 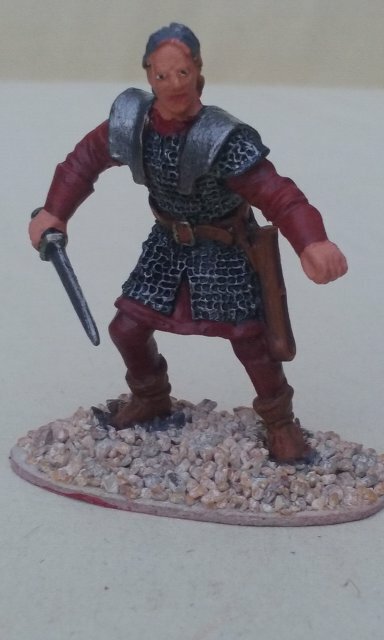 ^^' This miniature came straight to me from Milo's Attic on November 2014 thank you my dear hobbit!! 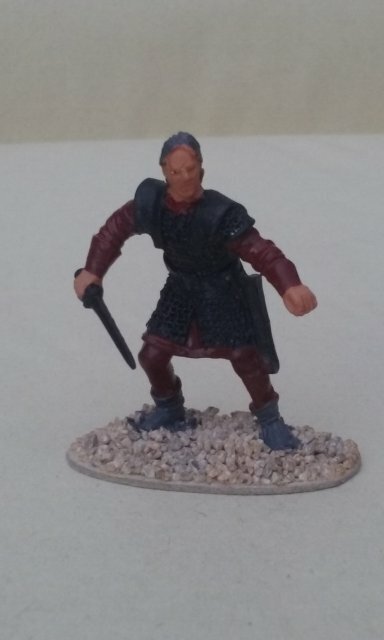 This is m247 The elf-warrior of Nargothrond, just as it came to me next to it is the next stage were I polished, clean the moldlines and slighty primed him with the AB and brush. The idea behind the slight primer layer is to not loose a single detail behind a thick layer of primer. I started adding a little sandpaste and some bigger "rocks" to the base to add a little bit of variation within the base limitations (same last time), then worked all the metals with scale75 metal'n alchemy steel set paints for a shiny/polished TMM kind of look. 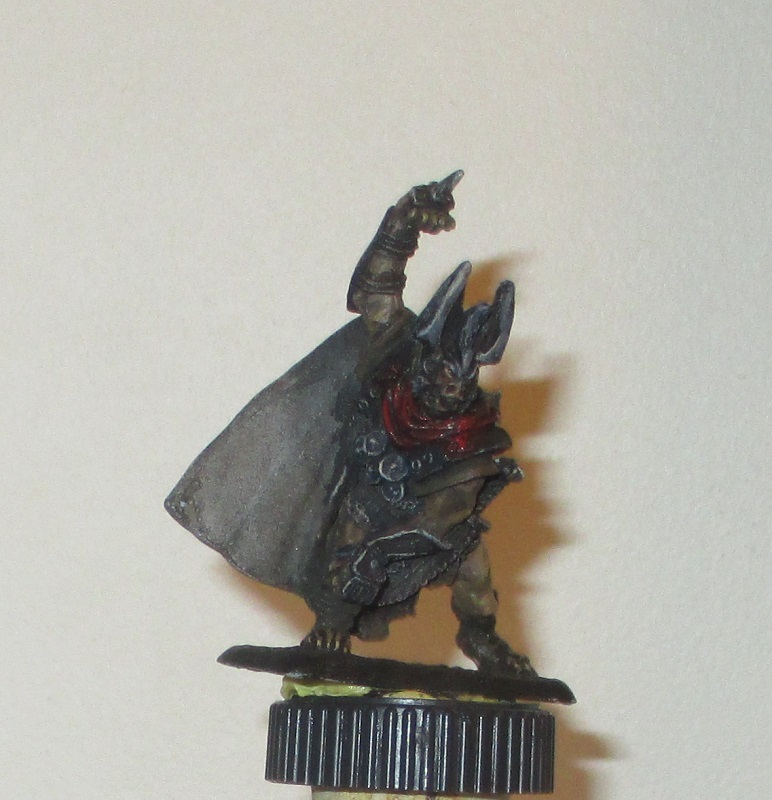 Next I simply washed the base with GW Agrax Earthshade to make everything on it to stand out a bit. Followed by the eyes, the face and hair. As always I fought with the eyes to make them look correct.... then shifted to the cape "outer side", which I wanted to work in blue colours, followed by the inner part of the cap, in which I experimented a lot with the texture, painting a first layer of a leatherette brown and then dabbing with a sponge (foam from a blister) and some red-brown and black inks, then added some very thin lines of a light beige in between the layers of inks. At some point in between the inner part of the cape and the face I worked the wings on the helmet in a nice range of brown-greys. Well, it seems, that not only Master Maenas pushed the forward bottom last weekend. Me too- because it was a snowy weekend. As it is a re-paint project I wanted to hold on to the blue- ish colour of the coat from the past. But I decided to take another blue tone this time, indigo in this case and mixed it with "raw umber" and a bit of "golden ockre". I used "burned and raw umber" for the dirt and also some white. For the black colour of the coat´s back side I took "black iron oxid" instead of "ivory black" as it seems to be "warmer" while shading it with white. Unfortunatley the "glance" is to much and there are lots of more reflections on it. While doing the work on "thinner that coat" I grapped the thin layers of black colour so much, that the look of the metal parts become really "used". Maybe you can correct it with a layer of matte varnish? I have always had envy of how you managed desaturated colours that nicely. I see many very nice works in progress here. I also managed to paint 2hours this week-end. 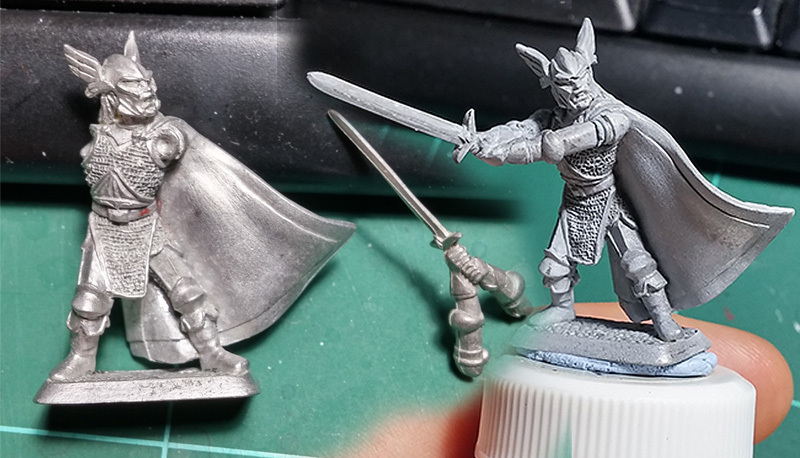 I go for NMM, let's see at the end if it is a good choice or not. The threat for me will be I need more time than 2 weeks. I managed to do some painting yesterday. I am facing non expected problem with my red paints (3 pots) which all turned bright (I don't know why). I am late, so I fear I shall only focus on mini & forget about little diorama I have in mind. Er, sorry Milo, but I think you also should concentrate on taking better pictures as there is nothing much that can be seen in those two you provided. - Sorry again, I know it's always easier to criticize when you yourself (which in this case is me) is not involved in the matters you criticize. - So, take this with a laugh, please. Indeed, I have done wrong upload here and checked "resize" option. I will correct this tonight. Thanks for the highlight master ent. Master Ent picture are uploaded again.